Last night's episode of BOSTON LEGAL was perhaps the most thought-provoking and the most entertaining in the remarkable two-year history of what I believe is the single best hour on American television. The primary storyline in "Witches of Mass Destruction" targeted the War in Iraq with a poignant plea for the citizens of this nation to abandon the entrenched polar positions of both political parties and encouraged, instead, a healthy dialogue aimed at both reason and understanding. Of course, leave it to pompous Denny Crane (portrayed by the irrepressible William Shatner) to say it best: "We Republicans never waiver -- no matter how wrong we are!" At the same time, erudite and arrogant Alan Shore (played by the brilliant James Spader) openly admits to being a flip-flopper in the past but whose mindset is now just as entrenched, albeit on the opposite side of this divisive issue. What's truly amazing is that these two over-the-top, outrageous fictional characters are able to so eloquently express themselves and their points of view with passion, with clarity and within a matter of mere minutes. If only windbags like Rush-a-Dope Limbaugh and I'm-Not-Yet-Dead-Ted Kennedy could do the same. Credit Creator/Writer David E. Kelly; when he is on his game no one is better. 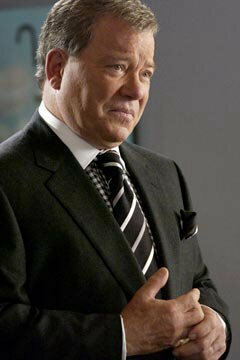 In BOSTON LEGAL Mr. Kelly has consistently delivered a prime time show that puts all others to shame. Clearly no TV drama is better cast, especially now with the addition of Candice Bergen as one of the firm's partners, Shirley Schmidt. The production values are top notch all the way around and the editing is as crisp as the bacon at the Stage Door Deli. Simply put: BOSTON LEGAL is "must-see TV." HOUSE OF WAX -- Holy Carnauba!